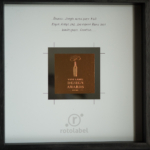 A special thanks to the team at Whitespace Creative, our design company who were so creative in the design. A NATURAL WINE TASTING will be held at Caroline’s Fine Wines, Strand Street, Cape Town, on Wednesday, 21st January from 5pm to 8pm. 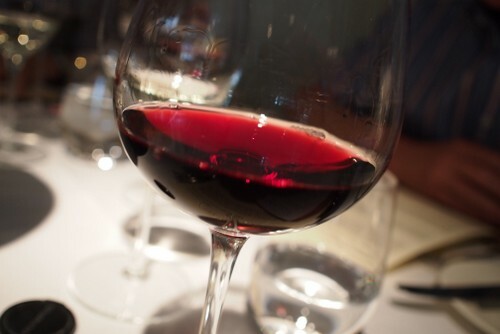 To find out more about natural wine, Click here for details. There will be thirteen French wines – Domaine Foillard ( Beaujolais ), Morgon & Fleurie, Dom Breton Vouvray & Chinon, Thierry Germain Saumur Blanc et Rouge, Rene Moss Anjou ( Chenin ), Pierre Gerbais Champagne, Herve Souhaut ( Rhone ) Gamay & Syrah. Elgin Ridge is proud to be part of the Natural Wine Tasting, standing by side with these great wines. We are the only certified organic farm in Elgin and farm using traditional methods. Doug Wregg, will say a few words at 6pm. Doug is the sales and marketing director at Les Cave de Pyrene, a company specialising in artisan, organic, and biodynamic natural wines, in the UK. Les Cave de Pyrene also own several natural wine bars in London. Doug is sometimes an outspoken advocate of the more natural approach to winemaking, and is co-founder and co-organiser of, The Real Wine Fair, London’s most prominent annual natural wine festival. 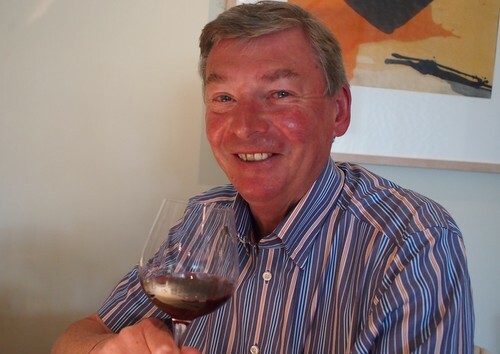 Doug writes regular blogs and columns for various food and wine magazines in the UK, and is considered an expert, and leading proponent, in the Philosophy of making wines in the most natural and environmentally-sustainable way. Elgin Ridge is a unique certified organic vineyard in Elgin. We believe in farming using traditional, long since forgotten, methods. This has enabled us to become the only certified organic farm in Elgin. Visit us and taste our sought after wines, produced from our organic grapes. Lunch will be served between 12h00 and 14h30, overlooking the vineyards. Booking is essential as we have limited space. Wine will be available by the glass or bottle. After a cool and very wet summer, harvest at Elgin Ridge started with the Chardonnay (Marion’s Bubbly) on February 11th. This was followed by the Pinot Noir on February 24th and the Sauvignon Blanc was started on March 12th and finished on March 18th, a full two weeks later than 2013 reflecting the cool season. Whilst a challenging vintage, the fruit was perfectly ripe at the time of picking, and bunch selection was rigorous. thus eliminating any sub-standard fruit. All varietals produced juice of excellent quality and all were naturally fermented without any inoculation of commercial yeasts. This produces relatively slow ferments which preserve natural flavours and aromas thus reflecting the true attributes of the location, climate & soil. All the wines are potentially the best so far from Elgin Ridge, with the Pinot Noir looking outstanding, with fine fruit and good acidity. The Sauvignon Blanc probably has the best expression of the varietal we have had and whilst the Chardonnay has much reduced yields, the quality is excellent. A challenging vintage which required diligence and a determination not to sacrifice quality for quantity. 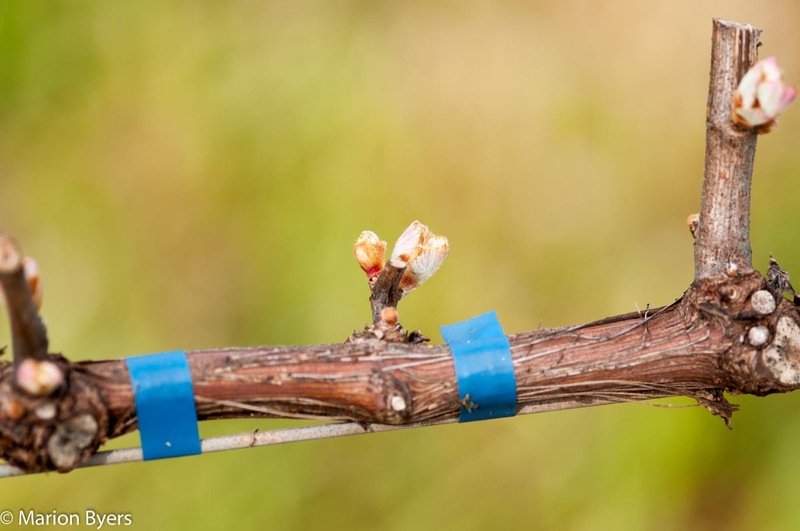 Each season our vines burst into life looking healthier and healthier, The vineyards which produce our organic wines have not been sprayed with any chemical since 2007, Which might be why our wines receive such rave reviews. We are often asked, how can we farm organically when many organic vineyard owners get very low yields, but at Elgin Ridge, we are blessed, achieving really good yields. So take a look at what happens at Elgin Ridge behind the scenes to make our wonderful wines. We make and use biodynamic preparations from our own cow dung and make our all our own compost from cellar waste and any organic material on the farm. 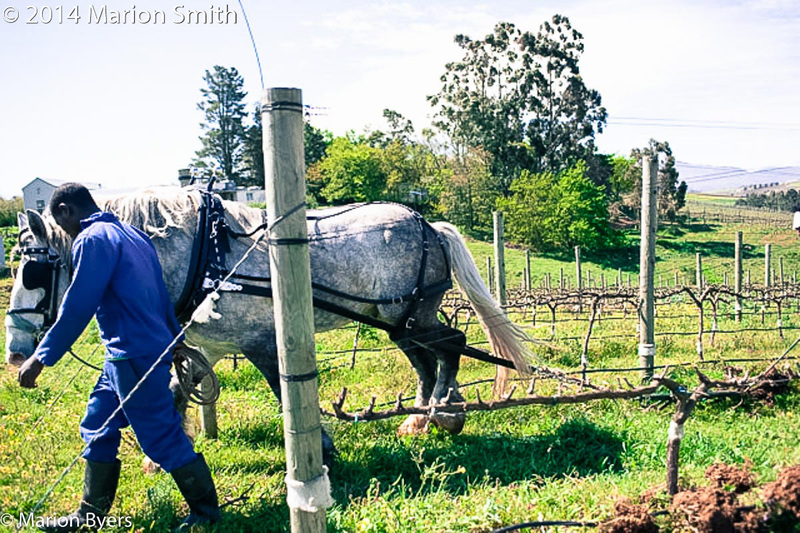 A big work load, farming organically, is weeding each row of vines by hand, having visited Burgundy last year, and seen how horses are used to plough the weeds back into the soil, we now have Maddox on the farm, Maddox a gentle, enormous, Percheron, loves ploughing. He only needed two training sessions and he was ready for work. Had a great lunch at the Glass House, Kew on Monday, with Brian Smith, a now-biodynamic winegrower in Elgin, South Africa. I first met Brian and his wife Marion at the same restaurant just over a year ago (so my blog tells me), and they’ve now got to the point where they have their first Pinot Noir bottled. Plans are afoot to produce a Chardonnay-based MCC (sparkling wine), but this won’t be ready for a while. Brian and Marion are gaining confidence. For example, with the Sauvignon, the 2012 is the first where they felt able to do 100% natural ferment. In the previous vintages they did the small tanks natural, and the large inoculated, for safety reasons. Now they leave the wine on lees until December (the harvest is early March). In 2012 Brian says he made 90% of the wine (with help from Niels Verberg); in 2013 he made 100%. Brian says that he planted Pinot Noir because he’s ‘a red wine drinker trapped on a white wine farm.’ The 2012, first release, won’t be out for a while, but it’s looking very promising. 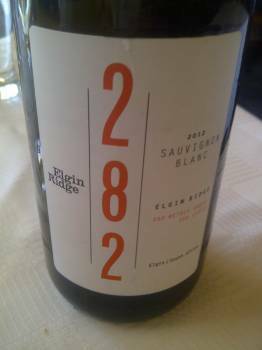 The Sauvignon Blanc 2012 from Elgin Ridge retains the winning quirkiness while simultaneously losing some of the rough edges of previous vintages. No exaggerated aromatics but Golden Delicious apples, green melon and an intriguing hint of spice on the palate. Total acidity is 6.7g/l but you’d never guess – nine months on the lees adds plenty of texture without the wine becoming unduly heavy. Owners Brian and Marion Smith set out to be organic since acquiring the small property in 2007 and acquired official certification in October 2011. “I’m pleased we’re avoiding the green, acidic style of Sauvignon. I agree with you about that quirkiness but I’m not sure where it comes from,” says Brian. My guess is that this is another instance where organically grown grapes are contributing to a wine that isn’t same old, same old. 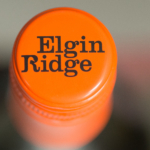 Elgin is cool—both in terms of the wines it is producing, and also in its temperature. 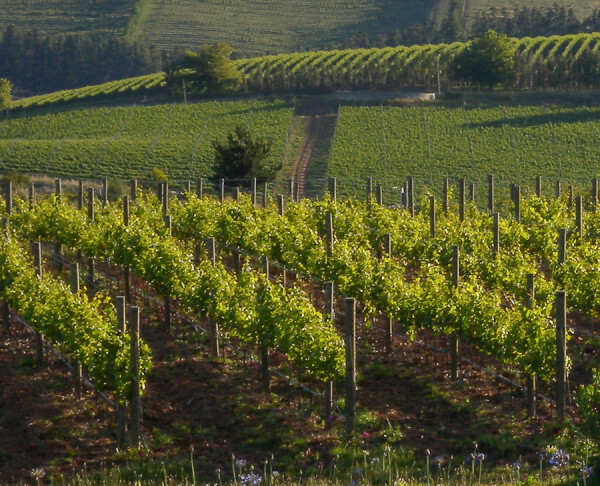 While South Africa has quite a few wine regions, it only has a few that are cool enough to be able to grow fussy cooler-climate varieties such as Riesling and Pinot Noir well, and Elgin is one of them. This is one of the reasons why there is such a buzz about this relatively new region. In terms of South Africa’s wine region classification system, Elgin is currently a ‘ward’, but is likely to soon become a wine ‘district’. And of the country’s wine regions, it’s the only one with natural boundaries – in this case, three mountain ranges and the sea. Geographically speaking, Elgin is a bowl surrounded by mountains, with the valley floor at 300 m, and the highest vineyards are 900 m. If harvest date is used as a measure of climate, this is the coolest wine region in South Africa. Elgin is famous for its orchards, and apples are still the main crop here, with 60% of South Africa’s apples coming from the region. The first orchards were planted in Elgin by Sir Antonie Viljoen in the early years of the 20th century, on his enormous Oak Valley estate. Viljoen was also the first to plant vineyards here. However, wine production stopped in the 1940s, and it wasn’t until the mid-1980s that vines were to return to Elgin. 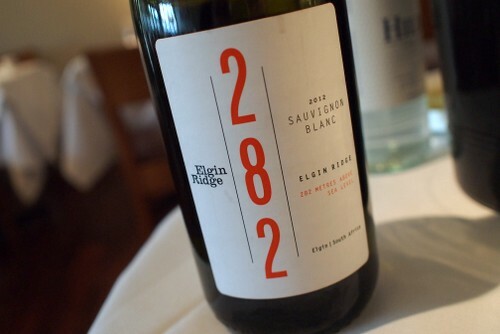 The modern era of Elgin wine began in 1985, with the planting of an experimental vineyard at Oak Valley. 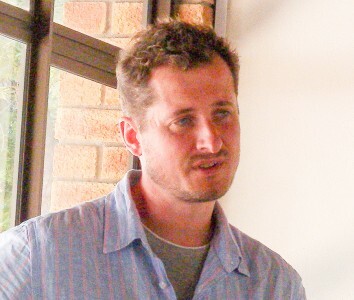 The following year, the first commercial vineyards were planted by Paul Cluver, and the first wine released from the region was the 1990 Paul Cluver Riesling. Another Elgin pioneer is Andrew Gunn, whose property is Iona. In 1997, having made his money from a medical suture company, Gunn bought a run-down apple farm in the Elgin region. Now it’s one of South Africa’s leading producers of Sauvignon Blanc, although 15 hectares of apple trees still remain alongside the vineyards. It’s at an altitude of 420 metres, with a view of the sea, which is just 3 km away. Gunn didn’t plant blind; he knew what he was doing in selecting this site. Initially, he put temperature loggers around the farm, and found that the climate here was significantly cooler than expected over the three months that the loggers were recording data. He was able to compare his farm data with those from the Elgin weather station. Because there was a consistent relationship over his three month trial, he was then able to extrapolate his data out over the whole growing season. The exciting results showed that this site was cooler than equivalent places in Europe where Sauvignon Blanc was grown. If the grapes could ripen, then the results could be quite exciting. Peak summer temperatures here are usually 24–25 °C, and if they experience three days over 30 °C, then it’s unusual. Gunn’s uncle was a professor of geomorphology, and he came out in 1997 to do a survey of the site. It showed that the farm had post-glacial alluvial soils: it was an old river valley. The first harvest was in 2001: by South African standards, it was a late one, straddling the end of March and beginning of April. Gunn found that he was getting good fruit set and a long ripening period, which seemed ideal. Sauvignon Blanc is the main focus, and 65% of Iona’s plantings are accounted for by this variety. Gunn also owns another farm down in the valley, with Syrah, Mourvèdre and Viognier planted. He never has to acidify. The main farm has 29 hectares of vines, while the property in the valley is 11 hectares, making a total of 40. And what of Oak Valley, another of the Elgin pioneers? Although they planted their first experimental vineyards in 1985, their first serious vineyards weren’t planted until a few years later. It’s an 1800 hectare farm, with most of the area devoted to fruit production. On the farm there are 48 hectares of vineyards. Oak Valley make superb Sauvignon and Chardonnay, and the Pinot Noir is also really good. Then there are newcomers, such as Elgin Ridge, owned by Brits Brian and Marion Smith. They moved there in 2007 after selling their Kingston-based IT business. They’d always wanted to do a vineyard project but it took them a while to decide where to do it. Initially they had thought about making sparkling wine in the south of England, but the land was just too expensive. Then they considered France, but found that the wine industry was in turmoil and most of the properties on the market were there because the people were struggling to sell their wine, and they were expensive to boot. So they turned to South Africa, and a property in Elgin that ticked all the boxes. Marion had first visited Cape Town in 2002, and liked it so much she came home having brought a holiday flat. Brian visited in 2003 and while he was staying there tasted a Sauvignon Blanc that he liked so much (the debut vintage of Iona), he went to visit the owner, Andrew Gunn. They became friends. They have so far planted 4.5 hectares, with 3.5 hectares of Sauvignon Blanc and half a hectare each of Chardonnay and Pinot Noir. 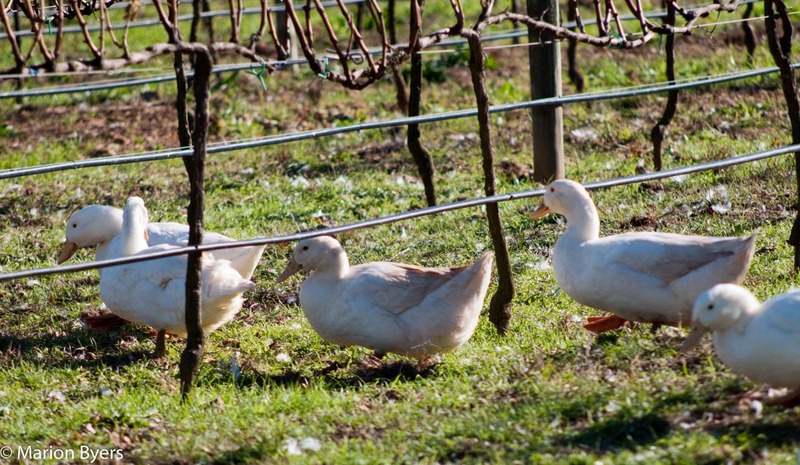 They are organically certified, and as of this year Marion – who looks after the vineyard – has decided to go biodynamic, a decision prompted by a visit from Monty Waldin. They have just bought two Dexter cows, to complement their ducks. ‘The dogs and cats don’t know what to make of them,’ says Brian. Production is 15 000 bottles this year, rising to 20 000 next year. The goal is to peak at 40 000. Another newcomer, albeit only geographically, is Catherine Marshall Wines. Established for a while but previously based in Stellenbosch, Cathy moved into her Elgin winery in 2011, and is making top quality Pinot Noir and Sauvignon Blanc with grapes purchased from Elgin growers. The real strength of Elgin seems to be its ability to produce top quality wines from a range of varieties. Riesling is superb; so is Sauvignon Blanc. Chardonnay is superb; so is Pinot Noir. 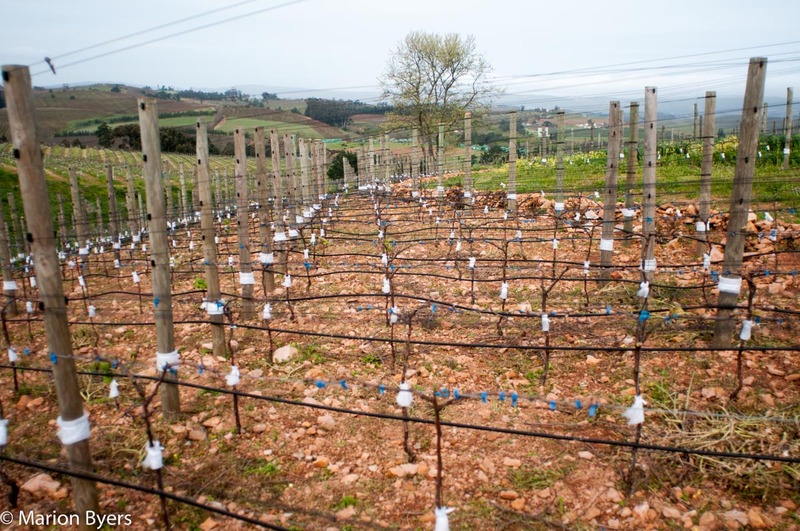 It seems to be hard to pigeonhole this fascinating cool-climate region, and with increasing experience of the terroirs here as well as advancing vine age, it seems the best is yet to come. I was honoured to have lunch yesterday at the Commodore Hotel, Cape Town, with the Irish ambassador, Mr Brendan McMahon and the visiting Irish trade delegation. 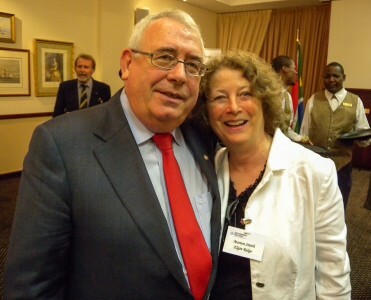 In addition to the Irish trade delegation, led by Ireland’s Minister for Trade and Development, Mr Joe Costello, TD, several Irish business owners, who now live in South Africa, also attended. South Africa is Ireland’s fifth largest trading partner and it was announced that a contract worth Euro 500m had been won by an Irish company to build wind farms in SA. Ireland has been particularly successful in the technology sectors, and it is expected that this visit will establish not only more trade to South Africa, but also encourage South African businesses to expand into Ireland. 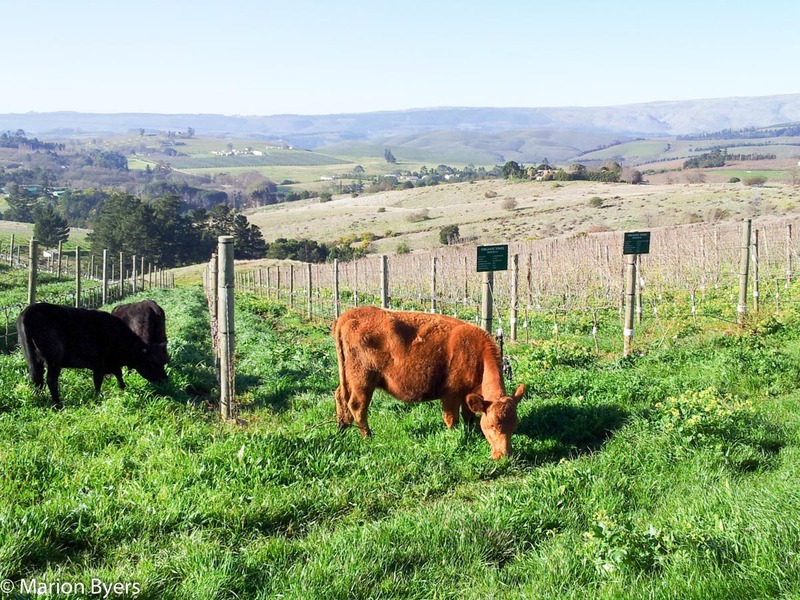 When biodynamic guru Monty Waldin came to Elgin Ridge in April this year, he suggested that we look into adding a new element to our biodynamic practices…in the form of a cow. Little did we realise some five months later that Elgin Ridge would become home to a small, yet very precious herd of Dexter cattle. 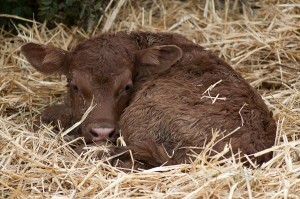 The end goal of Monty’s suggestion to get a cow, was the creation of a cow pat pit. In the pit the cow manure is mixed with biodynamic preparations and allowed to ferment. After some time this mixture, now abounding with natural enzymes and bacteria, is applied to the soil. This process greatly complements our existing organic practices by increasing microbial activity and the overall health of the soil. After Monty’s visit and an extensive amount of research, I decided that Dexter was the breed for Elgin Ridge. Dexter are a naturally small breed of cows that are known for their docile nature and calm temperament. What was even more charming about these cows, and which appealed to me sentimentally – I’m Irish and my grandfather had a cattle farm in Ireland – is that they are an old Irish breed. The choice could not have been more fitting! So, not only is our little herd thriving but also thanks to Ruby and Molly, who are providing our pat pit with the best possible manure considering they are nursing, so is our pat pit and soil and ultimately our preparations for our 2013 vintage. © ELGIN RIDGE WINES. ALL RIGHTS RESERVED.